David Williams has been fascinated with how we see since childhood. The noted Rochester vision scientist clearly remembers hanging out in the studio workspace of his sculptor father. “Though his career was sculpting, his hobby was optics and astronomy,” says Williams, now the William G. Allyn Professor of Medical Optics. “As a kid I played under the table where he was grinding mirrors for the telescopes he made from parts found in the local junkyard. He always had a microscope on hand so he could sketch the diversity of microscopic organisms he came across. 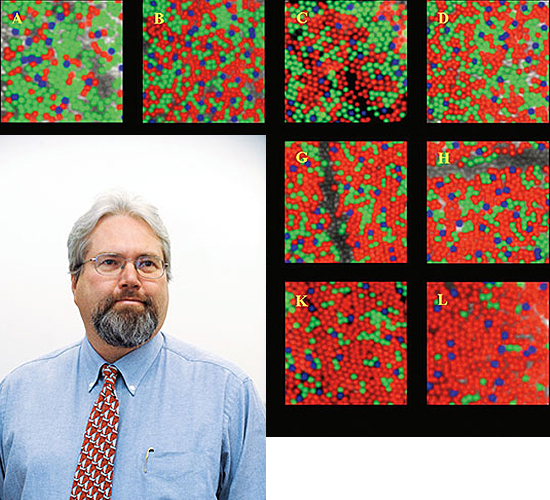 FIRST SIGHT: With breakthroughs such as obtaining the first images of a living human retina and of the distribution of color-sensitive cones in human retinas, vision scientist David Williams is altering the understanding of many eye diseases. Decades later, Williams, a professor of brain and cognitive sciences, has brought many of the elements of that childhood image—an intense interest in vision, a curiosity about how things work, an ability to share his insights with colleagues, and even a connection to astronomy—to his work as a scientist and as director of one of the world’s top centers for vision research. Since 1991, he has directed Rochester’s Center for Visual Science, an interdepartmental program that brings together researchers from more than 25 laboratories and six academic departments to conduct research in the biology, physiology, and neurology of vision and perception. Founded in 1963 by the late Robert Boynton, the center is widely considered a pioneering leader in vision research. And for the past two decades, the reputation of the center has been burnished by the leadership of Williams, says Peter Lennie, the Robert L. and Mary L. Sproull Dean of the Faculty of Arts, Sciences, and Engineering. “He’s made a strong center with an international reputation even stronger,” says Lennie, who is himself a noted vision scientist. “He’s done this through encouraging faculty appointments and forging strong collaborations with the medical school. “In his field, he’s peerless,” says Lennie. The contributions of Williams to the field of vision science have helped sharpen many ideas about how humans see and how technology can be used to improve human vision. Using a system that corrects for aberrations that result as light travels through the human eye, Williams developed a way to obtain the sharpest pictures yet of the retina inside the living eye. The technology, which is based on a system first used in astronomy to correct for aberrations caused by atmospheric distortion, is now used worldwide by scientists studying such blinding diseases as glaucoma, retinitis pigmentosa, age-related macular degeneration, and diabetic retinopathy. The same technology, known as “adaptive optics,” is also helping people see out into the world more clearly. It’s the basis for several Rochester-born efforts to improve laser-based vision correction surgery and efforts to develop custom-made contact lenses for people with certain eye diseases. Widely recognized for his work, Williams received the 2006 Friedenwald Award, one of the highest honors given by the Association for Research in Vision and Ophthalmology, the world’s top organization of vision researchers, and the 2007 Bressler Prize, a highly coveted award from the Jewish Guild for the Blind. He also is a fellow of the Optical Society of America, the American Association for the Advancement of Science, and the American Psychological Association. Regardless of the accolades, Williams still exudes the enthusiasm of a scientist who’s always interested in exploring a new idea. “What is the neural circuitry responsible for our remarkable ability to open our eyes and immediately take in so much information?” Williams asks. “It’s absolutely incredible. A member of the faculty since 1981, Williams holds—in addition to his main appointment in brain and cognitive sciences—positions in ophthalmology and biomedical engineering as well as at the University’s Eye Institute and at the Institute of Optics. He completed his undergraduate degree at Denison University and his PhD at the University of California at San Diego, both in psychology. The move allowed him to work closely with colleagues well versed in engineering and optics, which he soon realized, would greatly broaden the way he could explore vision. One of his first questions revolved around the limits that humans face in their vision. While most sighted people take the process for granted, the complex steps that determine how we see are divided between the eye, which collects light and turns it into an electrochemical signal, and the brain, which interprets those signals. Williams turned his attention to the retina, where light-gathering cells are located. But he faced a difficulty: The aberrations of the eye’s cornea and lens limited how well he could see into the eye. When he first arrived at Rochester, Williams tried a variety of techniques to overcome these aberrations but none was completely satisfactory. Eventually, he came across adaptive optics. The technology proved useful to astronomers because as light passes through the earth’s atmosphere, it becomes distorted, resulting in a fuzzy image. At the heart of adaptive optics is a precisely controlled deformable mirror which has tiny pistons attached to its back. As light is collected, it’s analyzed by a computer that then sends signals—up to 30 times a second—to the pistons. The pistons push and pull the mirror, sharpening the images. “We were one of the first (groups) to recognize the possibility of using adaptive optics to correct eye aberrations and the first to do it successfully,” Williams says. The technology has helped Williams and his team take images of individual cones, the cells responsible for color vision, in a living person, a major breakthrough in understanding the normal eye as well as diseases affecting the eye. Previously, cones could only be studied after the eyes had been removed from cadavers. Williams’s breakthroughs in imaging the eye are helping advance clinical research, says Steven Feldon, a professor of ophthalmology and director of the University’s Eye Institute. Eye surgeon Scott MacRae, a top practitioner of the laser-guided vision correction surgery Lasik, was attracted to the University in part because of the potential for collaboration with Williams. Even without surgery, adaptive optics has the potential to improve the way we see. Geunyoung Yoon, a former postdoctoral fellow in Williams’s lab, now directs his own University lab to explore ways to use adaptive optics to craft customized contact lenses that improve vision in people with a variety of eye diseases. The further development of customizable contact lenses is the latest in a longstanding collaboration between the University and Bausch & Lomb that has grown out of work by Williams and his research group. In 2006, Rochester and the storied company signed their second five-year agreement to work together to explore the basic sciences of eye diseases. The two partners began the string of collaboration in the mid-1990s when Williams and his team first embarked on a pilot project to explore the potential of adaptive optics. Interest in basic research—in trying to find answers to compelling questions—continues to drive Williams. Joseph Sorrentino is a Rochester-based freelance writer.